Coffee cheesecake is packed full of coffee flavor. It’s rich in flavor and incredibly creamy. To finish the coffee cheesecake, I added coffee whipped cream and chocolate covered espresso beans. The best baked cheesecake recipe for coffee lovers! 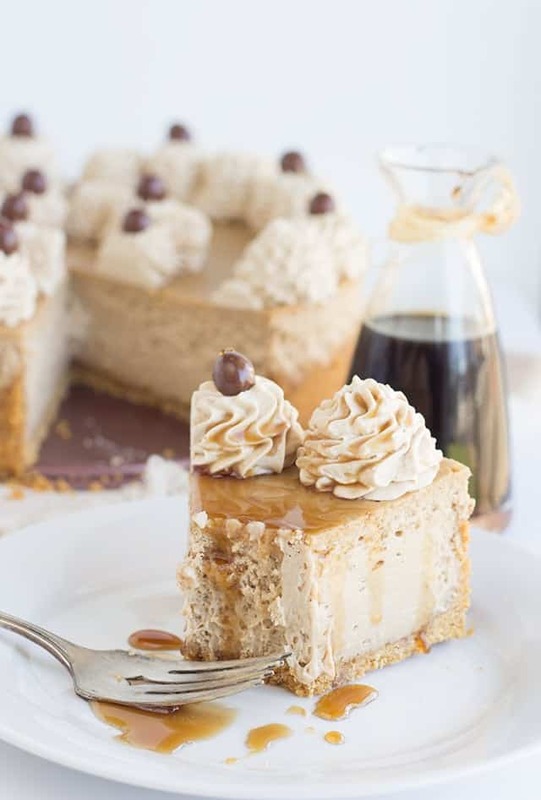 It’s time to embrace your coffee love with this coffee cheesecake! Well that is, if you haven’t already. I’ve been sort of coffee crazy lately with coffee cookies, coffee cupcakes with coffee buttercream and coffee syrup so I can understand if you’ve given in already. This baked cheesecake is packed full of coffee flavor. It’s rich in flavor and incredibly creamy. To finish the coffee cheesecake, I added coffee whipped cream and chocolate covered espresso beans. My hubby and son aren’t huge fans of coffee treats, which is okay with me. It’s just more for my tummy, but I do share with my dad who can’t get enough of these sort of desserts. He’s the only person I know that can go through half a dozen coffee makers in a years time. The man lives off of coffee. What kind of coffee should I use in the coffee cheesecake? So, I didn’t use strong brewed coffee. I find that in most recipes, it’s too much liquid for the amount of coffee flavor I want. To fix that, I like to use instant coffee. It adds a lot less liquid and as much punchy flavor as you want. If you have a specific instant coffee that you prefer, use it. Coffee cheesecake is packed full of coffee flavor. It's rich in flavor and incredibly creamy. This is the best baked cheesecake recipe for coffee lovers! In a mixing bowl, add the graham cracker crumbs, sugar and melted butter. Stir until the butter coats all the crumbs. Press the crumbs into a 9.5 inch spring form pan. Press the crumbs up the side of the pan as well as the bottom of the pan. In a small bowl, add in the instant coffee and water. Stir to combine. Add in the coffee mixture and eggs one at a time. Mix each egg completely before adding the next. Also scrape down the bowl after adding each egg. Place in the oven at 325 degrees and let bake for 1 hour and 25 minutes or until done. To make sure the cheesecake is done, give it a wiggle. If it slightly jiggles in JUST the middle like jello, then it's done. If it jiggles all over, it needs to bake longer. Turn off the heat and crack the oven door slightly. Let it cool in the oven for an hour or two. I kept mine in the oven for about 2 and half hours and then placed it in the fridge. Add in the coffee mixture and powdered sugar. Continue to beat until it becomes thick. Add the whipped cream into a piping bag with a 1M tip. Pipe 8 swirls on top of the cheesecake. Add a chocolate covered espresso bean to each swirl. Refrigerate until ready to serve. I suggest letting the cheesecake chill overnight. Slice the cheesecake and add a drizzle of coffee syrup. The syrup is totally optional! This looks lovely! I wonder if one could use espresso powder instead of instant coffee? I wonder if it would be too strong? I haven’t tried it, so I can’t say for sure. I would think the espresso powder may be a little stronger. You can always just add a little less. Hi there Miranda, that is just soo Yummy, and being a coffee freak myself, this is something that I must try out this coming weekend. The ingredients also seem to be readily available and easy to make. Hi Christine! Yep, add it in with the sour cream! Thanks for letting me know!! Should you turn the instant coffee grounds into coffee first, or just mix the ground with the water? Just mix the instant coffee with the water. You don’t want it to be too runny otherwise it will mess with the consistency of the cheesecake. Hi! you mentioned we should put the whipped cream on top of the ganache….what ganache? is that in the recipe? Under ingredients for the coffee whipped cream, it lists “1/4 powdered sugar”. Is that 1/4 cup? Whoops! It is cup, sorry about that! Thanks! I bake lot of cakes. Tried cheesecake for the first time though. And Wow!!!! Simply amazing recipe. 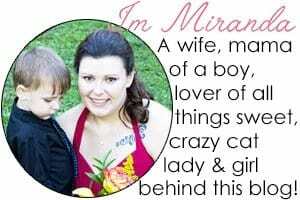 Loved it!! I am late to the party here, so-to-speak, but what is the liquid drizzle which is showing in the photo? I made the cheesecake last evening without the bit of cream, since I missed it. However, the cake looks beautiful and is the first cheesecake I’ve ever done without any cracks! The liquid drizzle is a coffee syrup. I added a link to the recipe in the recipe. Yay for a cheesecake with no cracks! In the recipe for the filling you say to add heavy cream but in the directions there is no area telling to add the heavy cream. In the recipe for the whipped cream you only add “1/4 powdered sugar”, I’m guessing it is a 1/4 cup but just making sure. Hi Clara! I updated the recipe. Sorry about that and thank you for pointing the mistakes out to me. You’ll add the heavy cream with the sour cream. You were right in guessing 1/4 cup as well. Thank you again for letting me know and I hope that you give the recipe a try! 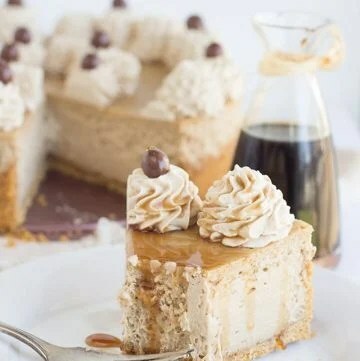 Hi 🙂 I’m excited to make this coffee cheesecake! Does it have to be instant or can I just use regular coffee grounds? I’ve never tried using coffee grounds. I guess it would be okay other than you’ll have coffee grounds in your coffee cheesecake and I’m not sure if they’ll pack as much coffee flavor as the instant coffee granules do. It worked great! I used grounds and substituted the water for coffee 🙂 this was delicious, thank you for sharing! Wanted to use my largest springform which is 11″, so I used 4 8 oz cream cheese, upped the sugar, sour cream and heavy cream by 25%. Followed baking instruction time, turned oven off but did not crack door open per another successful recipe. Couldn’t be happier! Thank you so much. Do you recommend making the whipped cream for the top after the cheesecake has cooled overnight in the fridge? Thank you! Hi Kelly! It will be fine if you make it a day ahead, but I personally would make it the next day after it’s been chilled!